One of the highlights of television drama in the 1980s, Talking Heads was a series of six television monologues transmitted on BBC1 in April and May 1988, written by the acclaimed playwright Alan Bennett. The last episode, A Cream Cracker Under the Settee, was broadcast on 24 May 1988, 29 years ago. 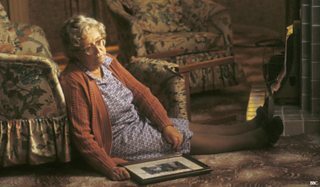 In it, Thora Hird portrays Doris, an old lady who has had a fall while dusting (not being satisfied with the efforts of her home help), and then looks back over her life as she contemplates her predicament. The role won her the Best Actress award at the 1989 BAFTAs, with the series receiving eleven nominations in total. Maggie Smith was awarded Best Actress by the Royal Television Society for another episode Bed Among the Lentils, and the collected scripts won Bennett the 1989 Hawthornden Prize. 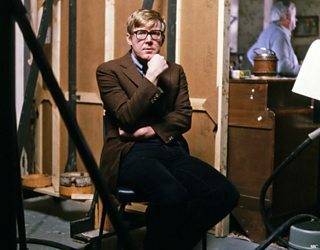 Alan Bennett was born in Leeds in 1934. After National Service he studied history at Oxford and began to perform comedy, including at the Edinburgh Festival Fringe, which was already gaining renown as an alternative to the ‘highbrow’ official Festival. In 1960 the organisers of the latter, wanting to refute the idea that only the Fringe could produce successful comic revues, approached Bennett to work on a show with fellow Oxford graduate and musician Dudley Moore, and Cambridge alumni Jonathan Miller and Peter Cook. The title decided on was Beyond the Fringe – the idea being that the show reached a level the Fringe could not aspire to. It was an instant success at Edinburgh, and plans were soon made to open in London’s West End. Traditional revues were usually frothy and superficial, but Beyond the Fringe tackled subjects like the death penalty, the nuclear deterrent, and the mythologising of the Second World War. Peter Cook’s impersonation of the prime minister, Harold MacMillan, was seen as shockingly irreverent, as was Alan Bennett’s monologue as a vicar – mocking the clergy was also taboo at the time. The show was credited with starting a ‘satire boom’, but its success was really down to the fact that it was almost unfailingly funny. 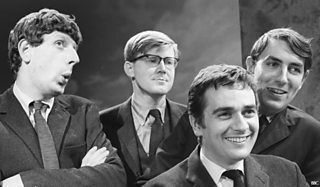 Beyond the Fringe - Jonathan Miller, Alan Bennett, Dudley Moore, Peter Cook. Bennett was the obligatory quiet one, and also the only one who had done National Service. Television soon embraced satire with That Was the Week That Was and Bennett contributed sketches to its successors, BBC3 and The Late Show. He also wrote his own TV comedy series, On the Margin (the cast featuring a young John Sergeant, pre-journalism, and pre-Strictly). Bennett’s first stage play, Forty Years On, opened in 1968, a nostalgic, revue-format look at England in the form of a public school concert. In 1972 Bennett wrote his first television play, A Day Out, a film about a bicycle club outing just before the First World War. By 1982, Bennett's plays were a regular feature of television schedules, and that year the BBC broadcast a collection of new works, which are usually known by the strand title Objects of Affection. They included Intensive Care, Say Something Happened, and A Woman of No Importance. A Woman of No Importance was a monologue, featuring Patricia Routledge as Peggy Schofield, a secretary who thinks herself the linchpin of her office, until she becomes ill. Bennett originally planned to direct it himself, and so structured the play simply, as he had never directed for television before. Monologues were of course not invented by Bennett, and television monologue plays (as opposed to traditional comic or rhetorical monologues) have been attempted from time to time – eponymously in Harold Pinter’s 1973 play Monologue, performed by Henry Woolf. Bennett returned to the monologue form in 1988 with Talking Heads. Each of the six episodes starred a different actor, with Bennett himself appearing in the first, A Chip in the Sugar. Patricia Routledge returned (as a different character) in A Lady of Letters, and Maggie Smith was in A Bed Among the Lentils, as mentioned above. Soldiering On was performed by Stephanie Cole, and Julie Walters portrayed a struggling actress, Lesley, in Her Big Chance. Finally came A Cream Cracker Under the Settee. Thora Hird had worked with Bennett several times before, but this was her tour de force. Born in Morecambe in 1911, she had a long career as a character actress, with her first television appearance in 1947. From 1963 to 1967 she starred with Freddie Frinton in the popular sitcom Meet the Wife, which made her a household name. In 1986 she joined the cast of Last of the Summer Wine, and she also appeared in Victoria Wood’s Dinnerladies. A Cream Cracker Under the Settee is by far the most poignant of the monologues (though not quite a solo piece – a policeman is heard at Doris’s front door asking how she is, though he soon departs when she lies that she is all right). It is a tragedy, not only because Doris has got into her predicament through her own fussiness, but we hear how her grief at the still-birth of her only child ruined her relationship with her husband, and drove him to an early grave. At the end, it is implied that Doris’s fear of ending up in a home will result in her dying alone and in pain. In all the monologues in Talking Heads, what the solo character says is never the whole truth. Bennett’s masterly ear for dialogue, for the eccentricities of speech and the lies we tell ourselves is given full rein. Bennett himself has noted that in other plays he was prone to allow characters to talk at some length if they needed to, providing a kind of temporary monologue. He has also said that some of Talking Heads could work as conventional plays, with other characters giving their perspective on events. Talking Heads, and especially the final episode, made an impact that it is hard to imagine a television play having now. The series was also adapted for radio and stage, and became a set text in English examinations. After the success of Talking Heads, there was a short-lived fad for the genre, with two different series, Single Voices and One on Two emerging in 1990. The former had roles for actors such as David Jason and George Cole, the latter showcased comedians, including a relatively unknown Jo Brand. In 2000 Rob Brydon broke through with his monologue series, Marion and Geoff, and even EastEnders has dipped its toe in the waters, with the 2008 episode in which Dot (June Brown) records a message for her ailing husband, Jim. Bennett eventually wrote a second series of Talking Heads ten years later, but while they have their merits, they were not as memorable as the first, though that was a tough act to follow. They included return performances by Patricia Routledge, Julie Walters and Thora Hird, as well as roles for Eileen Atkins, David Haig and Penelope Wilton. Alan Bennett followed Talking Heads with plays such as A Question of Attribution, The Madness of George III (filmed as The Madness of King George) and The History Boys, which introduced the world to James Corden and Russell Tovey, among others. Now aged 83, as the success of The Lady in the Van shows, Bennett continues to produce highly acclaimed and enjoyable work.